We have just released the beta version of Memsource Translate, a new machine translation (MT) management solution which automatically selects the best-performing MT engine for your project, based on the language pair. Whether you are just starting out with machine translation, or are a seasoned user, one problem that many people face is trying to decide which engine is best for the content being translated - changes are made to engines and new language pairs are constantly added. In fact, we found out that in over 70% of translation projects in Memsource a more effective MT engine could be used, based on the Memsource MT engine quality ranking. Memsource Translate is effectively multiple machine translation engines in one. When you create a translation project with Memsource Translate enabled, the language pair is automatically detected and the best-performing MT engine for that language pair is attached to your project. The first version of Memsource Translate supports 69 language pairs. With Memsource Translate, you are able to manage multiple engines in one place - Memsource provides seamless payment and usage tracking of the engines you use. Currently, Google Translate and Microsoft Translator are available, but more engines will be added soon. 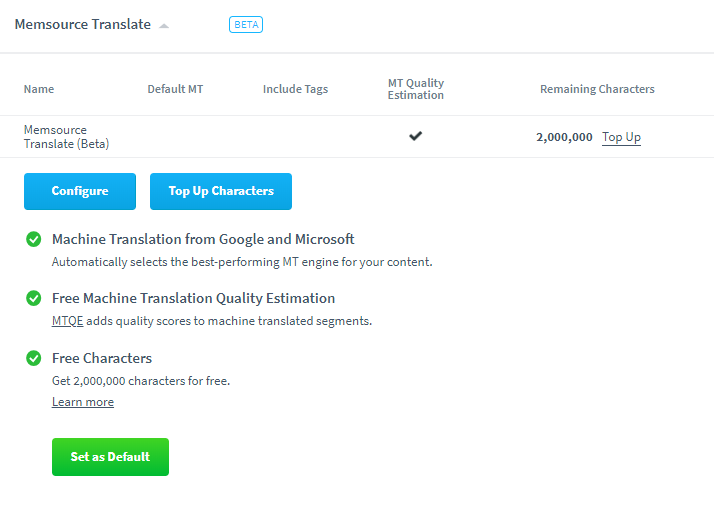 Memsource Translate also includes the latest version of Memsource’s AI-powered feature, Machine Translation Quality Estimation (MTQE). This feature provides real-time quality scores for MT output before any post-editing is done. Anyone can give Memsource Translate (Beta) a try. We are offering all Memsource users free characters to test it out. After that, you can top up your characters by buying one of our character bundles. We would love to hear what you think about Memsource Translate. Send us your feedback. Do you already have a Memsource account? Try Memsource Translate straight away.